Outdoor Activities: The first FitLot Outdoor Fitness Park debuts in New Orleans. Louisiana is the most obese state in the United States, and, sadly, many residents do not have access to safe and affordable fitness facilities. Now, after several years of planning, designing and fundraising, locally based non-profit FitLot has completed construction on its flagship FitLot fitness park. Known as The What You Give Will Grow FitLot, the outdoor public fitness park is named after the foundation of title sponsor and FitLot Champion, New Orleans Saints Pro-bowl Punter Thomas Morstead. 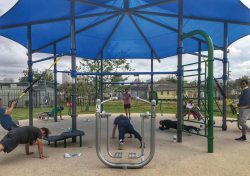 FitLot, which is designed to improve public health and safety in New Orleans, features a 1,700-square-foot shaded and safety surfaced area that has 15 pieces of outdoor fitness equipment and more than 50 attachment sites for resistance bands. The equipment is suitable for all abilities for those ages 14 and older, and it’s designed to withstand the weather. FitLot is located next to the playground at the Sojourner Truth Neighborhood Center, which is sited along the path of the 2.6-mile Lafitte Greenway that connects 17 neighborhoods from City Park to the French Quarter. The park will have a team of FitLot Neighborhood Coaches to help provide free guidance and fitness programs to community members. Also be sure to look for the free Wednesday workouts taking place now through June 14 at 5:30 p.m. The group circuit-training workouts allows everyone to work at their own pace and comfort level. Living with Lupus: A new online National Resource Center on Lupus empowers patients, health care professionals and families. The Lupus Foundation of America recently unveiled the National Resource Center on Lupus as a one-stop resource for those affected by lupus. In doing so, the resource center provides trustworthy, reliable and high-quality resources, programs and emotional support services in relation to this devastating and unpredictable disease. The content available on the National Resource Center on Lupus is based on 40 years of experience and insights gathered by working closely with world-renowned lupus experts and the lupus community. Information also comes from the Lupus Foundation of Americas National Needs Assessment on Lupus, conducted last year by the Lupus Foundation of America. Maria’s Pick — Pet Safety: A new pet directory connects neighbors as a valuable resource for reuniting lost pets with their families. Although National Pet Day was officially held in April, it’s never too late to protect our furry friends. According to research published in the Journal of Personality and Social Psychology, pets provide meaningful social support not only for people facing serious health challenges (such as recent heart attacks or HIV), but that even healthy people fares better with pets. As such, it’s important to keep them safe. The new Nextdoor Pet Directory is a social network that connects neighbors in more than 130,000 U.S. neighborhoods. Just go to the app and add your pet’s photos and identifying details such as photo, name, pet type, breed, color and size. Once a pet is added, it is automatically shared with neighbors in the community.